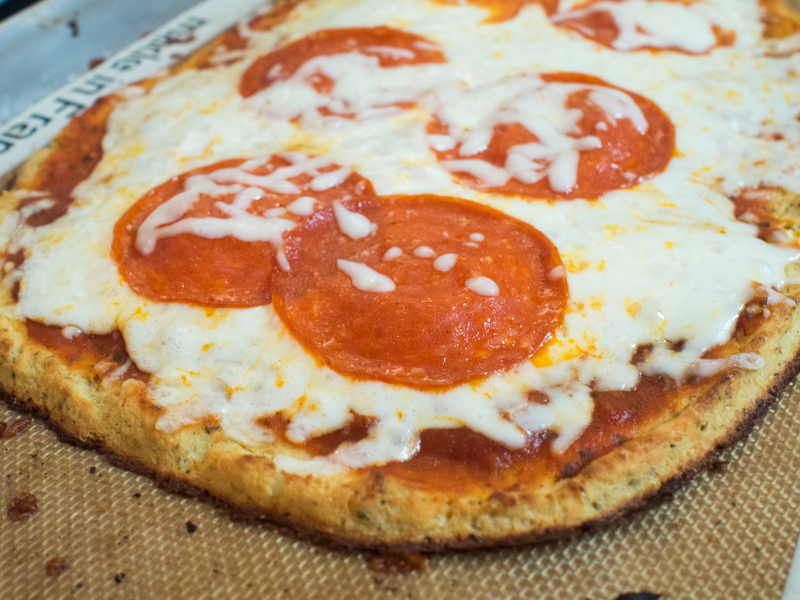 I’ve had a few readers ask me about Cauliflower Pizza Crust. To be honest, it took me a while to look into this because I was kind of like, meh. Cauliflower is everywhere. Rice, buffalo wings, and now pizza crust. Seriously. How much more can we torture one little plant? We don’t do this to broccoli, do we? What exactly was cauliflower’s crime? Being bland? Yup. That’ll teach ’em, now douse it with hot sauce and say it’s the same as wings. With paleo this and whole 30 that, people are trying to replicate dishes they like, but can’t have because of dietary restrictions. I totally get it. My husband has some health issues and truly needs to find alternatives to high carb, low nutrient dishes that he loves. But cauliflower crust? I put it up there with chocolate pudding made with avocados. We are jumping the shark here people. Nonetheless, I decided to look into it. I’m not a huge pizza fan to begin with, but everyone else is, so what could it hurt to give it a go? So, I searched the internet high and low and came across a wide variety of recipes. The general “how” of the recipe is that you pulverize the cauliflower, boil the pulverized bits and squeeze every last drop of scalding water out of the cauliflower by hand (natch! ), combine the bits with cheese, egg, and spices and form into a crust and bake. Dry cauliflower “flour” is the goal here, with egg as binder and the cheese as a bit of substance. I suppose the spices are to try to trick you into liking it. So I made it. There is something so very first world about taking a lovely head of cauliflower and pulverizing it into useless mush to make a quintessentially unhealthy fast food substitute. This kind of reminds me of wet grits. Anyway, you boil these lovely bits for a few minutes. I’m not the only one, grits, amirite? Ignore the obviously fogged picture. Sorry!! So, then you take about 7 minutes to aggressively squeeze the life out of the grits cauliflower. Damn the burned hands and hot water. Squeeze like your life depends on it, because dinner certainly does!! 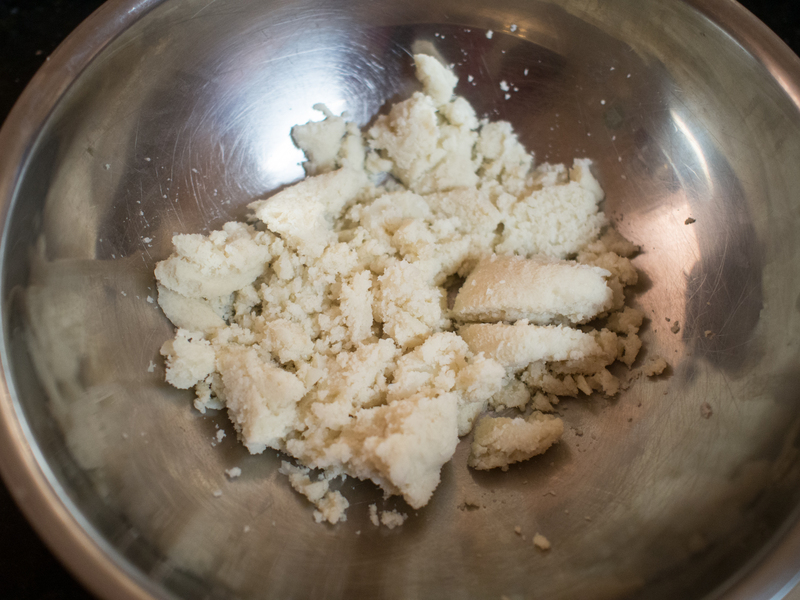 At the end of the squeezing, I got this sad little pile of cauliflower bits. I added an egg, cheese and spices and was able to mold a pizza-like shape out of it. I then baked it naked for a bit, topped it and re-baked it. The plusses, no one in a million years believed there was no flour in the recipe. Not my husband, nor the kids who watched me make it. I could cut the pieces and eat them by hand, remarkable considering there’s no flour in this recipe. The inside of the crust was a bit “droppy”, but the outside was fine. I think a smaller pie might have made the whole crust more crispy, as would placing it on a pre-heated pizza stone for the baking portion of the recipe. The kids loved it! My daughter considered it a wild success. This is huge, as her menu is rather limited. My son eats anything, so while I value his opinion, hers is much harder to win over. My husband said it was really good for what it was. Keep back, ladies, he’s all mine. The crust was really spot on, nicely spiced, fairly substantial. No clue whatsoever you were eating cauliflower and goat cheese. Truly. Was it pizza? It is a wonderful substitute if you are dying for pizza, but really want to stick to a low carb or gluten free option. You will, however, fool no one into thinking there’s isn’t something amiss with the crust. The minuses? Ugh, the work. The squeezing and the scalded hands. My recipe was inspired by The Detoxinista’s version of the crust. 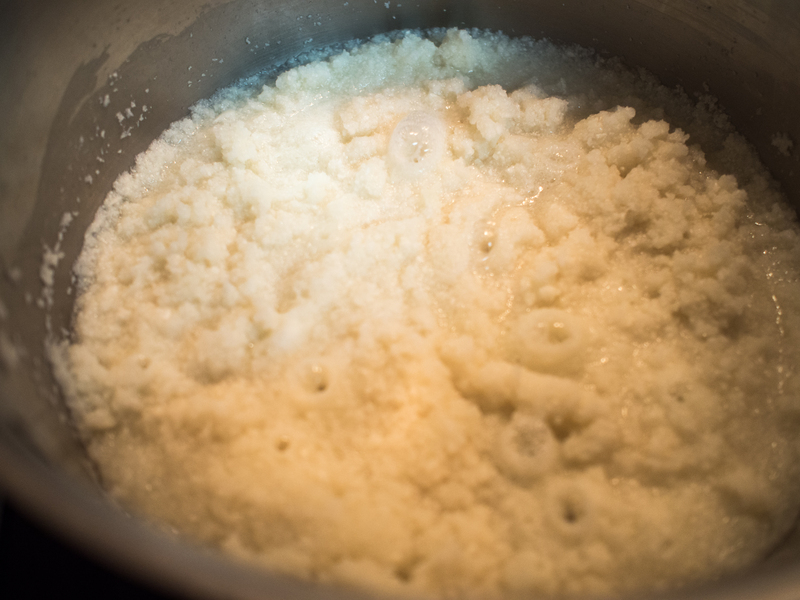 Boil the raw cauliflower rice in salted water for 4-5 minutes. Drain. 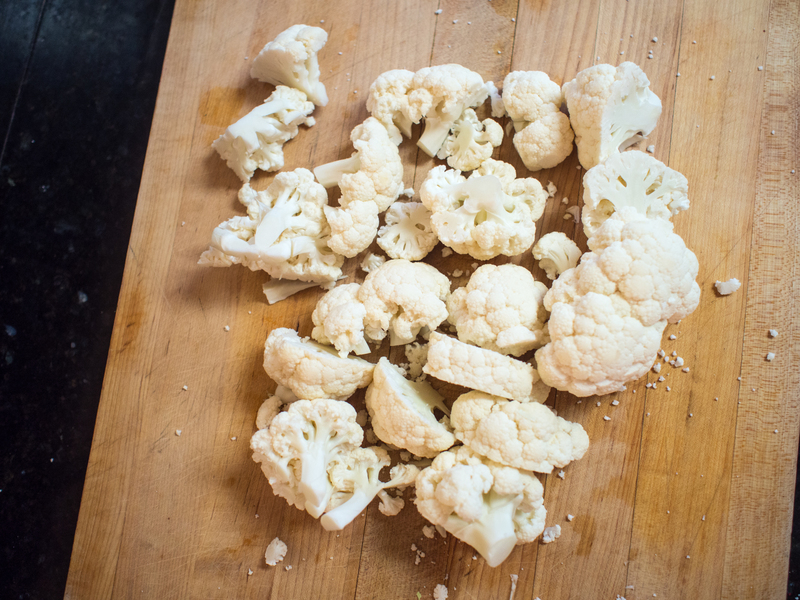 Place the boiled cauliflower in a clean dish towel and twist and squeeze all the water out of the “rice”. Squeeze until there is really no more water left. It will take a lot of time. If you decide to skimp on this part, you will be eating the pizza with a fork and knife. The horror!! Place the “rice” in a medium mixing bowl and combine well with egg, cheese and spices. 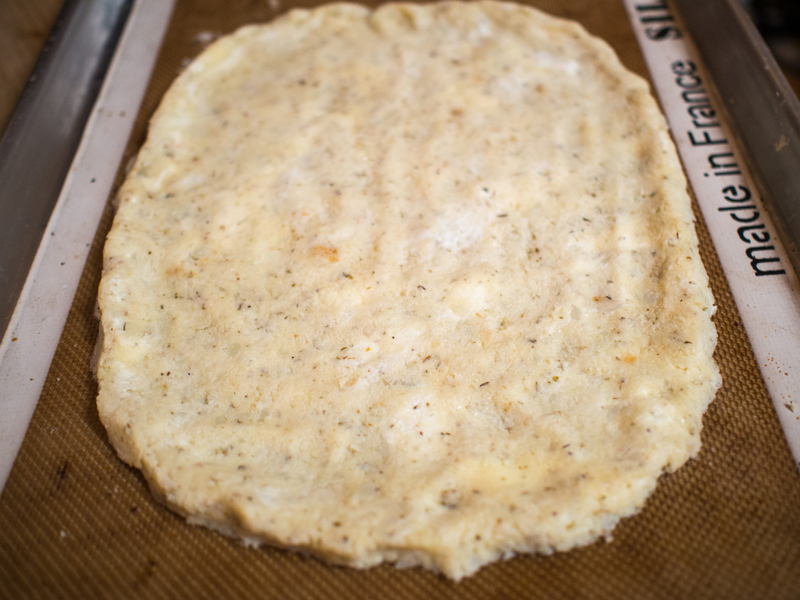 On parchment paper, or silicone sheet, form the “dough” into your desired pizza-like shape. I would not make it any thinner than 1/3rd to 1/2 an inch thick. The thinner the crust, the more likely it will be “firm”. However, make it too thin, and you’ll get holes in the crust. 1/3rd of an inch would be as thin as I would go. Bake the crust for 30-35 minutes, until the crust starts to brown and is fairly firm. At this point, top the crust with your favorite pizza sauce and toppings. Return to the oven and remove when the cheese is bubbling. This entry was posted in Uncategorized and tagged cauliflower, Gluten Free, Low Carb, pizza crust on February 8, 2015 by dawn of food.